Synopsis: As a shiny red car begins on a trip to a burger joint, a gas station, and a store, it drives into trouble. Car is stuck in a traffic jam next to a construction site, gets dirt slung on it, is choked by the smoke and exhaust from other cars, and receives a downpour of droppings from a flock of birds. Car is defeated. What will Car do? Why I like this book: Michael Garland has written and illustrated a delightful book with very simple text for young readers. For example, “Car gets wet. Splash, splash.” There is a lot of show and tell. He uses a lot of fun verbs to describe the action. His digital artwork is very expressive and colorful. Car’s headlights look like eyes and its bumper shows a toothy smile when it’s happy and a frown when it’s sad. Kids of all ages will enjoy Car’s animated expressions. Afterall, this is Michael Garland and his artwork stands out as a feast for the eyes! Make sure you check out the front and end pages for a view of Car’s neighborhood. This is an entertaining book for children learning to read on their own. It will be read again and again. Visit Michael Garland at his website. 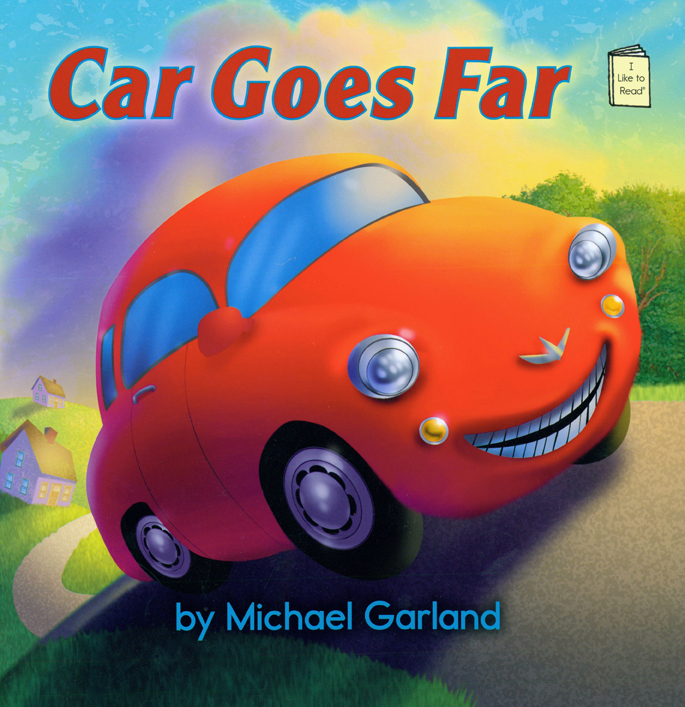 Posted on July 19, 2013 by Patricia Tilton •	This entry was posted in Children's Book Review, Michael Garland and tagged Car Washes, Cars, Humor, I Like to Read, Resilience. Bookmark the permalink. I just love the illustrations in Michael Garland’s books — all of them. And, this one is especially expressive and beautiful because kids have to read it by themselves. And, I won’t tell what Car does! That sounds adorable and a great lesson in resilience and attitude. Thanks, Pat! It is an adorable book to help kids learn to read on their own. It is a great lesson. Great boys book, but girls would enjoy it too! Looks like a really sharp, pretty book. Going from clean to dirty to clean is a great premise. I loved this book for kids. You should see when Car shivers/shakes. Hadn’t thought about that premise, but you’re right. What fun! And with Michael Garland, you can’t miss! Thanks for sharing, Pat. You’re right, you can’t miss with a Michael Garland book. This one especially cute for kids. I love the look of this. I also really do love the look of your website. I know I said it before, but it is so nice to visit. It really is a entertaining book for kids. Love Garland’s illustrations. Thank you, I like my new blog look too. This looks like a most excellent little book! I love that happy car! Thanks for sharing! It is a cute story that kids will like, Rhythm! And, the illustrations really good. This looks like a fun one. I see he’s on list of faculty for the Denver- SCBWI meeting. I’m debating on whether I can make it or not since, I’ve been to several conferences. I swoon more toward going to hear him speak! Enzo would enjoy this book, especially the pictures. He’d also enjoy his Mrs. Smith series, where a teacher reads from her big book and the kids are transported into the story. Michael Garland is such a nice person. Wish he was speaking at the Northern Ohio SCBWI conference this fall. Hope you go to the Denver SCBWI meeting. This is a fun book Erik for beginners. Glad you like my new look.